The message given to a group of 125 new SciMathUS students at Wednesday’s (6 February) opening ceremony was clear: Grab this opportunity with both hands, work hard, do your best and you will reap the rewards. 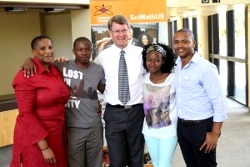 The students, their parents and funders of Stellenbosch University’s (SU) highly successful SciMathUS programme (Science and Mathematics at the University of Stellenbosch) were welcomed by Prof Arnold Schoonwinkel, Vice-Rector: Learning and Teaching. “Today is a big day, the start of a big opportunity for all of you. The fact that you are here shows that you want make the most of your opportunities,” Prof Schoonwinkel said. “You have made the right choice, a courageous choice. The programme’s success rate the past four years has been 100%. Every student who wrote exams passed and what’s more, they improved their Grade-12 marks by on average 15 percentage points,” he added. Twenty of this year’s 125 new students will also be the first to follow the programme at the Ukwanda Rural Clinical School in Worcester. The SciMathUS programme offers talented and motivated students, who are educationally disadvantaged and who did not qualify to be admitted to university programmes, a second chance to improve their marks in Mathematics and Physical Science. 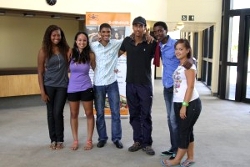 The programme, also part of SU’s HOPE Project, a campus-wide initiative through which major societal challenges are being tackled, is offered in Afrikaans and English, and teaches the students life skills, study skills, computer literacy as well as academic language skills. SciMathUS was launched in 2001 and over the years this one-year programme helped more than 750 learners to pass matric with exemption, of which almost 500 registered for studies at the SU. The 2012 group was another feather in the SciMathUS cap – all 107 students who wrote the final exam passed, continuing the 100% pass rate of the previous four years and boasting with an average increase of 15 percentage points. “An improvement like this in one year proves that hard work and commitment can lead to success. It also shows that everyone has the ability to make a difference in his or her life. We are proud of every student who made the most of what SciMathUS has to offer,” Ms Nokwanda Siyengo, programme manager of SciMathUS, said on a previous occassion. SciMathUS-students can also take Accounting and Mathematics. The Accounting group writes an Accounting examination set by the Faculty of Economic and Management Sciences at Stellenbosch University. The teaching in SciMathUS follows a problem-based learning approach and subjects are offered in an integrated manner. Students have to solve the problems themselves, closely monitored and facilitated by subject personnel. In this way students learn to take responsibility for their own learning. More than 100 former SciMathUS students have obtained degrees from various tertiary education institutions – most of which at Stellenbosch University. Two of these students are currently busy with their PhD studies, one in physics and one in medical biology.